Coy E. Carter, Jr. age 62, passed away Thursday, October 28, 2010. Mr. Carter was born in Walton County, Florida, on March 9, 1948. He retired from Solutia after nearly 43 years of employment. Mr. Carter was an avid outdoorsman who loved to hunt and fish. Survivors include his son, Coy E. ”Squirrel” Carter, III and his wife Beth; two granddaughters, Allie and Lacie Carter; and his mother, Grace Carter. A memorial service will be held at Faith Chapel Funeral Home North-Cantonment at 7:00 p.m. on Monday, November 1 with Rev. Bill Hodge officiating. Serving as honorary pallbearers will be Doug Tipton, Larry Dye, Oscar McNeil and Gene Barnett. The family will receive friends at the funeral home on Monday, November 1 from 5:00 p.m. until service time at 7:00 p.m. The family request memorials may be made in Mr. Carters name to Covenant Hospice. Jimmy Luther Bell, 72, of Atmore died Friday October 29, 2010, in Atmore. He owned and operated Bell Ford Automotive in Atmore for 16 yeras. He was born at Bell Fork, AL on July 14, 1938, to the late Luther Clark and Clemmie Shanks Bell. He was an avid Nascar fan as well as a Auburn fan. Survivors include his wife, Eunice H. Bell of Atmore; two daughters, Connie Bell Miller and husband, Andy of Denton, TX, and LaJuana Bell Bryars and husband Bo of Stockton, AL; three grandchildren, Zack Thomas, Camille Dortch and Alaina Miller; and one great-grandchild, Adaline Dortch. Services will be Monday November 1, 2010, at 2 p.m. from Johnson-Quimby Funeral Home Chapel with Bro. Glenn Bryars officiating. Interment will follow in Oak Hill Cemetery. The family will receive friends Monday November 01 at Johnson-Quimby Funeral Home from 12 noon until service time. Johnson-Quimby Funeral Home is in charge of all arrangements. Tate and Jay high schools’ 2009-10 ACT scores showed an increase when compare to last year, while results at Northview High School generally showed a slight decline. According to information released by the College Board, nearly 10 percent more Florida students took the SAT this year, almost five times the national increase, and experienced a one-point increase in the mean scores across all SAT subsections. At Tate High School, subsection scores in reading and science and the composite score all increased a full point or more. At Jay High School, subsection scores in English, reading and science and the composite score all increased by one point or greater. 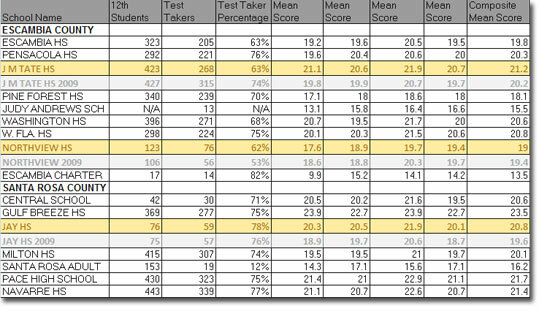 At Northview, there was a slight increase in the math subsection score. 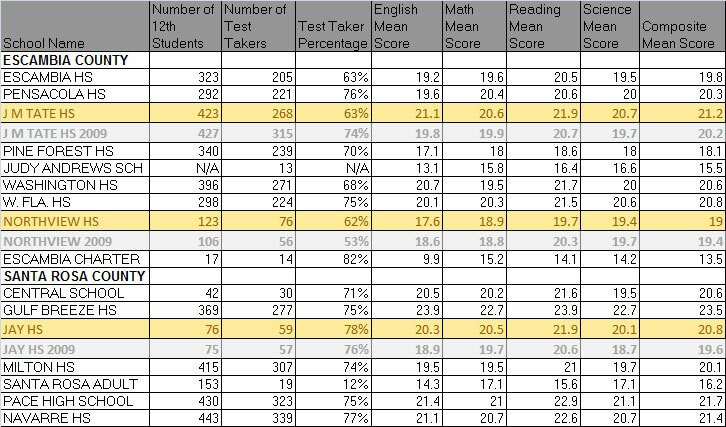 Pictured: The graphic above shows the 2010 ACT scores for schools in Escambia and Santa Rosa counties. 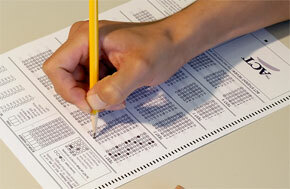 Scores for 2009 have also been included for Tate, Northview and Jay high schools. Click to enlarge. A 25-year old is recovering after being burned in a house fire early Saturday morning near Cantonment. The woman was burned in the fire on Western Pines Road off of West Roberts Road during the early morning hours. She was transported to a Pensacola hospital with burn injuries, and then transferred to the USA Burn Center in Mobile. Her name has not been released. Early voting has ended in Escambia County, with 2,107 voters casting ballots on Saturday. That brought the final early voting total in the county to 16,991 ballots cast — a more than 100 percent increase over the number of early voters in the 2006 general election, according to Escambia County Supervisor of Elections David Stafford. Polls for the 2010 general election will be open from 7 a.m. until 7 p.m. on Tuesday. Mark your calendars for lunch next Saturday — it’s time for the annual Walnut Hill Volunteer Fire Department Catfish Fry. The fish fry will be from 11 a.m. to 2 p.m. at the Walnut Hill Fire Station on Highway 97 on Saturday, November 6. Each $7 plate will include catfish fillets or grilled chicken, hush puppies, baked beans, cole slaw, homemade bread and dessert. There will also be door prizes, with the drawing at 1 p.m. Baked goods will also be for sale. The Northwest Florida Blood Center will also be conducting a blood drive during the event. Here is a schedule of Trick or Treat days and times, as well as fall festivals planned for today. Jay — New Bethel Baptist Church in Jay will host a Fall Festival on Sunday, October 31 at 4 p.m. Kids games, pie eating contest, Bible character costume contest, hot dogs and chili. 10995 Chumuckla Highway. Walnut Hill –The Walnut Hill Baptist Church Fall Festival will be held Sunday, October 31 at 4 p.m. Trunk or treat, costume contest, cake walk, food and more. Tonight: Patchy dense fog after 1am. Otherwise, partly cloudy, with a low around 55. South wind around 5 mph becoming calm. Monday: Patchy dense fog before 8am. Otherwise, partly sunny, with a high near 80. Northeast wind around 5 mph becoming south. Monday Night: A 30 percent chance of showers, mainly after 1am. Mostly cloudy, with a low around 60. South wind around 5 mph becoming east. Tuesday: Showers likely, with thunderstorms also possible after 1pm. Mostly cloudy, with a high near 76. East wind between 5 and 10 mph. Chance of precipitation is 70%. Tuesday Night: Showers and possibly a thunderstorm. Low around 61. East wind between 5 and 10 mph. Chance of precipitation is 80%. Wednesday: Showers likely and possibly a thunderstorm. Cloudy, with a high near 73. East wind between 5 and 10 mph. Chance of precipitation is 70%. Wednesday Night: Showers likely. Cloudy, with a low around 55. North wind between 5 and 10 mph. Chance of precipitation is 60%. Thursday: A 40 percent chance of showers. Mostly cloudy, with a high near 64. Breezy, with a north wind between 15 and 20 mph, with gusts as high as 25 mph. Thursday Night: Partly cloudy, with a low around 43. North wind between 5 and 10 mph. Saturday Night: Clear, with a low around 36. The Molino Homemakers Club is moving to a new meeting location, and the club recently made Angel Cards for hospice patients. The club will meet at 10 a.m. on November 3 at Aldersgate United Methodist Church, located on Highway 29 in Molino, just south of Highway 97. After several new ladies joined the group, a larger meeting location was needed. Membership is just $5 per year. 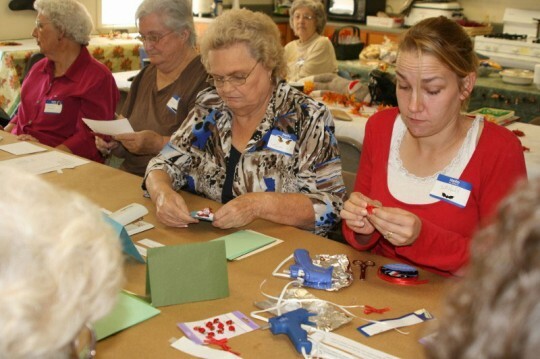 At a recent Molino Homemaker meeting Nancy Holland had club members pair up and make Angel Cards for Hospice. The Angels seem to come alive as they were put together with crocheted dresses, bells, ribbons and marbles. Club members pasted a verse on a piece of cardstock then the Angel was attached to the card and placed in an envelope. Elizabeth Barlow delivered the Angel cards to Hospice who will give them to their patients. 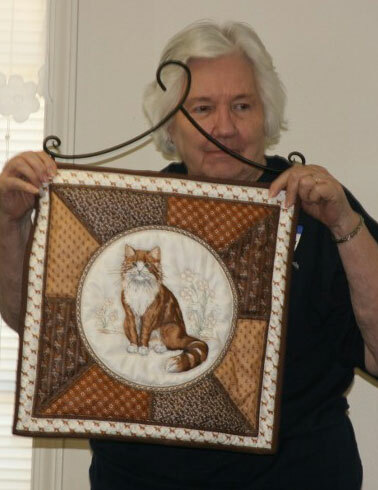 Several ladies bring projects each month that they have been working on and display them during show and tell. Pictured below, Frances Cheney and Becky Dorch show some of their work. Pictured top: Member of the Molino Homemakers Club make cards for hospice patients. Pictured inset: Frances Cheney displays some of her work during the club’s “show and tell”. Submitted photo by Terri Brown for NorthEscambia.com, click to enlarge. This weekend’s featured recipe from Janet Tharpe is a Strawberry Chocolate Eclair Fantasy. Lightly sweet and pretty as a picture, this colorful treat is a fantastic alternative to more decadent seasonal desserts. To print today’s “Just a Pinch” recipe column, you can click the image below to load a printable pdf with a recipe card.